An attempt to charge three Sophia residents, who were victims of attacks on Election Day last year, was aborted yesterday after it was realised that the wrong charges were prepared. As a result, Police Prosecutor David Goodridge told Magistrate Zamilla Ally-Seepaul that the proper charges would be laid against Bibi Farida Prasad, of 589 Section C South Turkeyen, Sophia, and Narine Khublall and Poonadai Khublall, of 588 Section C South Turkeyen, Sophia, next Monday. From left are Bibi Farida Prasad, Poonadai Khublall and Narine Khublall. 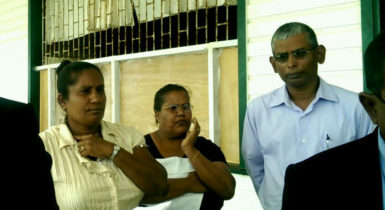 Prasad and the Khublalls along with their lawyers, Anil Nandlall, Priya Manickchand and Euclin Gomes, turned up yesterday at the Better Hope Community Centre for the arraignment. The trio had been told that they were to be charged with unlawful possession of firearms and ammunition. However, they and their lawyers were unhappy when they learned that the new charges needed to be prepared since Goodridge said the charges that were before the court were wrong as they would have been indictable instead of summary. The prosecutor thus asked the court for more time for the right charges to be filed by the police. Magistrate Ally-Seepaul granted the prosecutor more time to fix the charges. Nandlall described the situation as a complete abuse of the criminal justice system. “These persons are innocent, they are the victims of violence of arson, looting and malicious damage to property,” Nandlall said. He added that the defendants had never been accused of having in their possession unlawful firearms or ammunition. He said that their firearm licences were examined by the police and no one told them that charges would have been made against them. He also expressed concern that the wrong charges were brought to the court. “After one year of waiting the charges have been filed wrongly, after one year the police gets it wrong,” Nandlall said. The residences of the three defendants, which were used by the PPP/C as a command centre for electoral activities for the May 11, 2015 polls, were stormed, vandalised, looted and eventually burnt.